Cloud Gate, a.k.a. the Bean, in Millennium Park in Chicago is a go-to-place for tourists and artists alike. Watching as people experience the Bean for the first time is great. It brings out "the kid in the funhouse" in everyone. 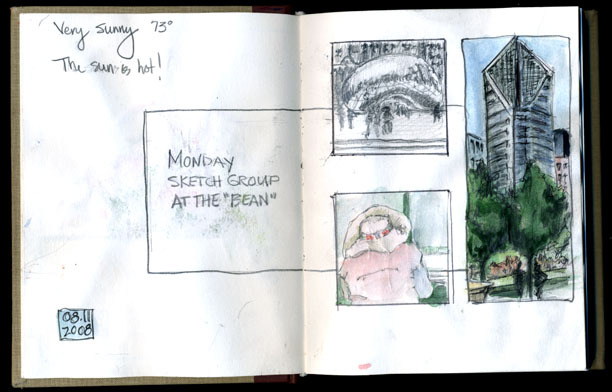 As you can see from Alex's post, it was a fun outing for Urban Sketchers Chicago to meet with Miriam from Munich. What a great time! Thanks to Alex and Miriam for setting it up! Our Monday sketch group was there yesterday but sadly, I couldn't make it. (Um - maybe not so sadly since it was raining all day.) 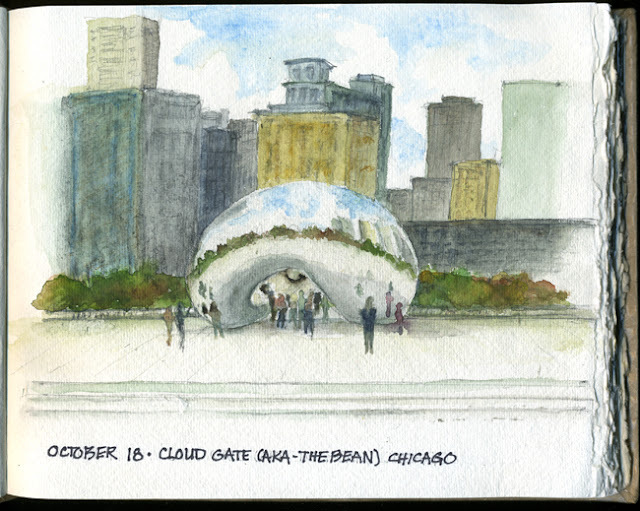 I've sketched many of the features of Millennium Park but I figured I'd post sketches from a few past outings to the Bean. Different size sketchbooks, different types of paper, different levels of success but it's always worth the trip! I highly recommend it! We have hosted our first visiting Urban Sketcher! 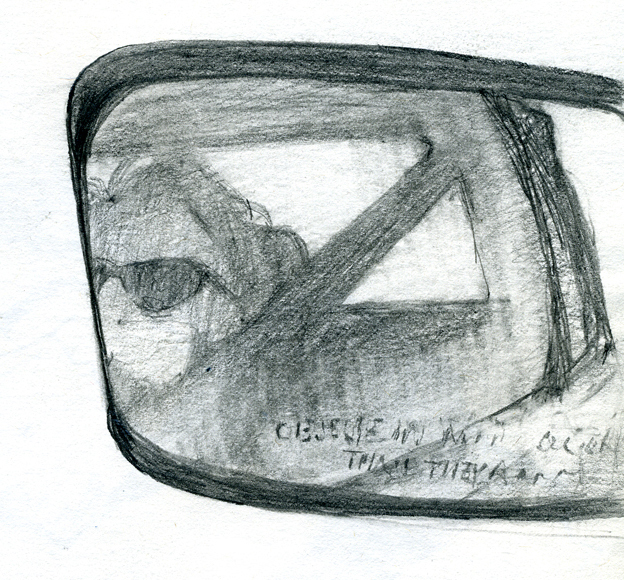 Miriam Ben from Munich Germany was in Chicago on a business trip and wrote to me about sketching together. I was delighted! To me half of the fun of Urban Sketching is meeting other sketchers. I put a call out on USK Chicago FB. Miriam had some air travel delays (air travel grrrr!) and finally arrived a day late. The four of us - Barbara, LuEllen, Martha and myself - met Miriam at the Palmer House and took her to sketch to Millennium Park, to The Bean. Officially it is Cloud Gate sculpture, but I don't know any Chicagoan who uses this. Miriam, it was wonderful meeting you! You must come back, we'll sketch some more! And here there are suddenly more of us! Tourists photographed us several times as a local curiosity: "Look, Mike! Chicago artists! Quick, take my photo with them!" I've been sketching and drawing ever since I can remember (Thank you Dad!). Being part of the Urban Sketchers' network is a great experience for me. I find inspiration in the work of my fellow sketchers as well as motivation to sketch more. Drawing regularly on location helps me see the marvelous daily beauty that exists all around us whether it's in a chaotic city panorama or the little detail in a single leaf. Thumbing through old sketchbooks, trying to decide on my first image to post here, I came across this sketch done quite a while back. It's of a pocket park just south of the main entrance to the Art Institute of Chicago on Michigan Avenue. It seemed a good example of "showing the world one drawing at a time", showing those little gems that sometimes I hardly even see until I sit down to draw. I hope you'll join Urban Sketchers Chicago often in discovering our world!